Less than 0.1% of voting members of the organization are selected annually for this member grade elevation. 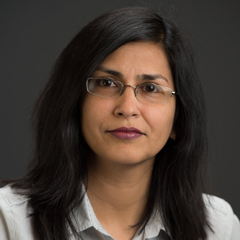 Fauzia Ahmad, Associate Professor in Electrical and Computer Engineering, has been named an IEEE Fellow. Dr. Ahmad is being recognized for her contribution to through-the-wall radar imaging. Dr. Ahmad received her Ph.D. degree in Electrical Engineering in 1997 from the University of Pennsylvania. Her research interests lie in the areas of statistical signal and array processing, radar signal processing and imaging, ultrasound imaging, waveform design and diversity, source localization/tracking and compressive sensing.